Forum Index > Historical Arms Talk > Most accurate formula for estimating longbow performance? Posted: Tue 25 Aug, 2015 10:42 am Post subject: Most accurate formula for estimating longbow performance? I need help in estimating medieval longbow performance (at close range) with different draw weights (80lb - 200lb) and different arrow grain/lbs ratios! “The Physics of Medieval Archery”. (Rees) # I couldn't find this article, if someone has a link pls post it! -(efficiency) e = .9 # 9 gr/lb should be 0.7 !!! -(mass bow) mb = 1 kg # does somebody know what is the ~ range of bow mass for every 10lb draw increment? -(kinetic energies) k = .04 # I presume this would be the coefficient for hysteresis, I've read somewhere that the range is between 0.03 and 0.07, I would greatly appreciate if someone would explain how is this coefficient calculated and post references! You need to get to know Mark Stretton of the EWBS...intimately! It would help allot if I'd knew the mass of the tested bows! There is no such formula, except in an average sense. The problem is that you can make bows of, say, 140lb, and have limbs of different masses, which is a key factor in how the efficiency varies with arrow mass. Furthermore, even with the same draw weight and draw length, the shape of the force-draw curve can vary. But one can try to answer this in an average sense. If you know the average stored energy, average loss through hysteresis, and average limb mass for the different draw weights, then the variation of efficiency with arrow mass can be reasonably estimated. 1. If you increase the draw weight the simple way, by just making the bow wider, mass increases linearly with draw weight, and stored energy increases linearly with draw weight, and arrow speed will be about the same for the same gr/lb. 2. If you increase the draw weight by making the bow thicker, but not wider, the mass increases with the cube root of the increase in draw weight. 3. If you just make the bow bigger, with the same shape cross-section, but wider and thicker, then the mass increases with the square root of the increase in draw weight. If a bow has an efficient cross-section, then it's wide enough for stability, and no wider. In this case, going to higher draw weights would keep the same shape of cross-section (case 3 above). Since there's a maximum thickness for a given wood, for a given length of bow and draw length (where the wood is strained close the elastic limit), eventually, the width needs to increase without increasing the thickness (case 1 above). where A=f^2*M. From a curve fit, find E_total and A. Assume that E_total is proportional to the draw weight of the bow, and A is proportional to the mass of the bow. From the scaling of mass with draw weight, you have a reasonable estimate of the behaviour. The trick is the transition from case 3 to case 1 in the scaling of mass with draw weight. What I'm trying to do, is estimate the max KE that a MR longbow would be able to generate, and after I know the max possible KE (for specific arrow type) for each bow lb category, I will compare them to the KE values needed tot pierce different armor types from "The Knight and the Blast Furnace" and "Defence Academy warbow trials". If 160lb@?inch longbow with ? gr/lb arrow generates 156J at close range "Primitive Archer test " (can't find this test, was the arrow speed cronographed? ), how much KE would and arrow (with the same gr/lb) have, if sent from a 200 lb longbow made from a very dense yew? Another problem is that, there is no bow mass data for the tested bows, or the bow profile dimensions. Maybe I can use supertiller to estimate the limb mass, but I don't know the dimensions of these bows and the properties of the italian yew that was used to make them. If I'd knew the 160lb Mary Rose longbow profile dimensions, maybe I could estimate the properties of the yew (moe,mor,density) that could generate the 160 lb force at @ 32", and the bow mass. They weren't all Italian Yew (in fact most weren't...) and just to make it even more awkward for you, the density and species of Yew is often irrelevant. I've made bows with very low density English Yew that came out far, far heavier than a piece of high grade Italian Yew of almost identical proportions. Wood is wood, and applying formulas to it doesn't really work. What I would suggest is buying Weapons Of Warre. You will never find a more concise and detailed account of every bow on the MR than in there - complete dimensions, cross referenced with grain type, predicted draw weight, density, length, cross section, design etc are all in there for each bow. Also, there is no dimension set for a 160lb bow. You can, as I mentioned above, take three bows of identical shape and size, and even from the same tree and end up with three bows 20 - 80lb different. Agree Will...'Weapons Of Warre' should be mandatory reading for all interested in the bow and it's mechanics. After reading the above I'm not sure I'm qualified enough to be a longbowman! I think we both know you're plenty qualified! This does complicate things, but how did they calculate the draw lbs (80-185) of the MR longbows if all they had was dimensions? From what I know they couldn't test them because they were affected by moisture! They tested a couple - in fact there is some really good film footage of Robert Hardy and the MR Trust drawing a few of the MR bows on a tiller, and of them breaking one! It's always been partly estimation however. The fact that they were sitting in sea water for 400 years prevents any real, solid defining tests being done, and because all bows are different and all wood is different you simply can't make black and white estimates and predictions on draw weight. All you can do is make exact replicas, using identical dimensions and timber as close as possible to the original you're replicating. There were so many bows, and so much variation in timber that even that does very little to achieve a definition of what a "Mary Rose" bow actually is. Some were far, far shorter than most people think, some were a completely unique cross section, some were made of terrible quality yew, and some of a quality we've never seen since. As for your current estimate of 80-185lbs for the spread of the bows, even that's probably incorrect. We know for a fact that a healthy, strong man can draw a bow of over 200lb - Mark Stretton obviously proved that, and Joe Gibbs can currently draw over that depending on the bow. Both of them are immensely strong, and have been doing it for almost a lifetime - as would a medieval archer. It stands to reason therefore that many, many archers would have been able to draw 200lb or over. We've got documentation describing Asian archers being able to draw 260lbs for instance. When you take that information (albeit somewhat assumptive) and combine it with the fact that a copy of even one of the smallest MR bows can hit 180lb with the right wood, the scope of draw weights is already immense, and probably reaches a far higher maximum than we think. For instance, I was at a warbow shoot a few weekends ago with Joe, and he showed me a 71" long bow made of English yew that was 180lb. It was tiny - indeed far, far smaller than the average MR bow - and if that can hit 180lb, the largest slab-sided bows and their relative poundage could be well over 200lb. You certainly know allot about archery, but I seriously doubt that many archers would have been able to draw 200lb or over. Also asians are not particularly renown for their strength! Although there aren't any gym exercises that can properly simulate the muscle mechanics in archery, this exercise would be the closest that I could think off https://www.youtube.com/watch?v=Una-Qjod5UI . As you can see this guy can pull over 310lb, but his form and motion range starts to suffer after 205lb. 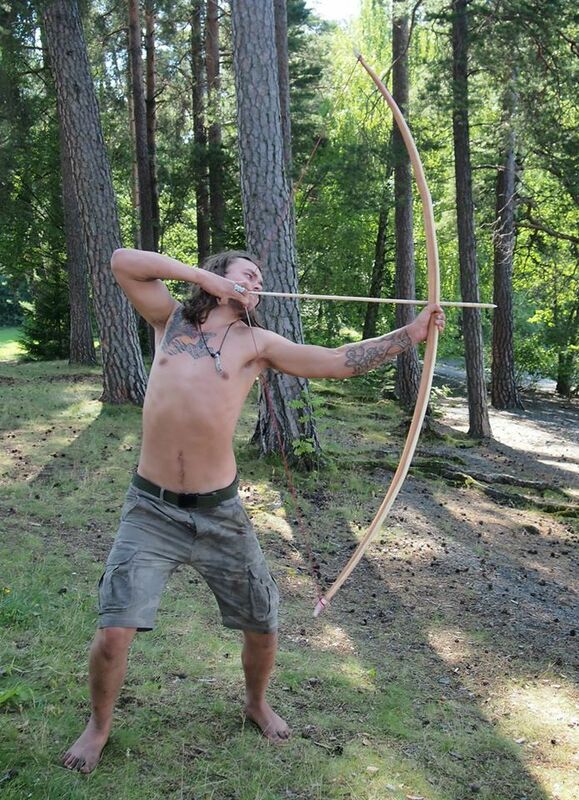 I would imagine that the medieval archer had to be comparable in back and deltoid strength to this guy to be able to pull 260lb bows, and I doubt that many were built like that (considering genetics and nutritional requirements) . Also regarding strength some ~60kg climbers can do one hand chin ups with 30kg weight attached, that's 1.5 their weight ratio, but those in the 100kg range cannot achieve this strength/weight ration, they are more close to 1/1. This strength/weight ratio should apply to archery too, thus most medieval archers that could draw over 180lb warbows should had over 180 lbs and proper genetics (dense bones and muscles and very strong and wide joints). I imagine that the medieval archers used warbows with draw lb lighter than their maximum to prevent injuries and maintain endurance, thus draw weights close to 200 lb should have been rare in battles. Arrow weights should also help estimating the upper limit of longbow draw weight! https://www.youtube.com/watch?v=MN2jAsE9ics Joe Gibbs, English Warbow Society, Quarter Pound Arrow Record Shot vs http://www.theenglishwarbowsociety.com/records2013_EN.html with same arrow, 155lb bow, max 240 yards. The above makes me question, if the increase in draw weight up to 200lb would be worth! It would be great to know Mark Stretton's and Joe Gibbs's recent discoveries in longbow (200lb range) performance! The video you posted was long. I do not know which exercise you were referring to. Maybe the Dumbbell Rows? Drawing a bow requires the middle back. Rear delts, traps, and lats. But, the way you are describing archery would not work. It makes sense that it sounds like difficult weight to pull. When pulled correctly, you will have much greater strength than a single arm. That guy in the video could easily pull a 200lb bow. Because he would be using his whole back, not a single arm dumbbell row. If I remember correctly, he started off with a Deadlift, which is great for everything. I don't know what kind of physical training they did back then, but I highly doubt they were physically weaker. Yeah, their nutrition and general health was lower, but they were incredibly active. All of them, all the time. Strength is a skill, not a measurement of the amount of muscle in your body. The ability to pull a 200lb bow gets easier with practice. Yes I was referring to dumbbell rows and it targets the muscle groups that do most of the work when drawing a bow, the whole body is involved for stabilization and some muscles are used mostly isometrically! So drawing a bow would be a variation of the dumbbell row with more impact on the upper back, in which you cheat by turning the body and help yourself with other muscle groups. Dumbbell row is a compound exercise (especially when cheating) so it does not use only a single arm and it doesn't isolate the lat. So I agree that you can gain more leverage when drawing a bow and you use more muscle groups but, I wouldn't go that far as saying that the work is divided on the whole back since the other half of the back is used more isometrically and along with the arm is used to "bend the bow" thus a compound exercise that resembles the push up (the push ups only work the back on the negative motion). That guy would easily pull a 200lb bow and probably + 260lb (don't know if so easily because of the other muscle groups that are not especially targeted by dumbbell rows). Back then, they didn't knew about strength training and how to specifically train (muscle mechanics, intensity and number of reps) for brute strength, and they were as strong (or maybe not "... their nutrition and general health was lower") and active as today's peasants, some of which are incredibly strong compared to the average urban individual, but cannot match the brute strength of WSM competitors or other strength athletes! I've posted that link to have an estimate on how much does things change after 200lb, and to appreciate how much does an elite strength trained individual is affected by such weights! I'm comparing Joe Gibbs indirectly to the elite strength athletes because I think he is one of them (after 15 years of training, I think is close to his genetic maximum potential), if high lbs draw archery would be considered a strength competition! So only rare individuals with particular build with right genetics can go over 200lb draw (that is if they don't permanently injure themselves, and if it's really worth the increase in lbs draw) ! I don't know Joe Gibbs's weight but I imagine that is ~1/1 ratio of draw weight / own weight and I don't think his diet was limited by the factors from 14 century! I also don't believe that a person that has a significantly lower body mass than Joe Gibbs would achieve the same performance in 15 years of training. Strength is intrinsic so it is not limited by the same factors that skills are. Many factors come into play when determining someone's brute strength: muscle density (related to the muscle hypertrophy type: myofibrillar vs sarcoplasmic), mechanical leverage of bones, joint strength, nervous system, muscle memory (for specific motion types)... . I've bolded brute because I want to clarify the difference between strength "types" from different competitions : WSM vs power lifting vs bodybuilding. WSM would be the purest brute strength display from those, because there is less potential for cheating (using leverage), powerlifters use specific training (muscle memory defines the best this type of competion) and leverage to achieve those performances so skill does play a "significant" part in this competition, bodybuilders could be considered a variation of the powerlifters because their ultimate goal is muscle aesthetics, and so they compromise their max strength potential to achieve more volume (definition) which means their muscles are not that dense (as those of powerlifter) but have more energy stores, and can achieve a higher reps with weights under their 1rep max weight! I would consider archery to be in the powerlifting "powerpulling" (use of leverage and muscle memory for specific motion type) category! Please don't consider this post as the "condescending type" it is not intended to be that way, and I'm the "kind" of person that states a personal opinion based on arguments (that could be interpreted differently by each individual), and I'm trying to have a constructive discussion. Ultimately I have no problem to "agree to disagree" and I respect each stated opinion, and appreciate the fact that you spent part of your free time to participate. So I highly value everybody's opinion regardless if it contradicts mine's! I think you may be approaching this from the wrong angle somewhat - have you shot a heavy bow yourself? Most healthy young guys can get 100lb bows back with ease after less than a year of the right training and the right guidance. That's with no special diet, exercising or determination. There are videos such as the one above of Joe shooting bows over 200lb, so it's not fiction at that weight. He certainly doesn't look like a weight lifter either (nothing at all like the guy in that video), and if you met him in the street I can assure you that you would never know he was immensely strong. You would not be able to pick him out of a line of normal, non-athletic healthy adult males. Also, the old "medieval archers were peasants" and "people in the middle ages had poor diet and health" myths have I believe long since been disproved - medieval archers were very highly paid soldiers by the time you're in the 15th/16th Century. Their diet would have been healthy and good, and they would all have been training - just like Joe today - from very young. It was in the country's best interest to have them strong, healthy and capable of drawing the most powerful bows possible. They're not being picked out of old, weak farmers and given a bow to go and fight with. If Joe can draw over 200lbs in his late 20s, to assume that this is rare seems to me slightly odd. The only reason he's so special today is because nobody else is pushing themselves to his level. In the middle ages, this would of course be completely different and I think it's perfectly safe to suggest that a huge number of archers would have been at exactly the same level as Joe is today, if not even stronger. Even if ALL of this is incorrect, and even if you disagree with everything above, none of that is relevant when looking at the actual evidence we have. We have the MR bows to make copies from, we have the arrows. We know without any doubt that if you make replicas of the slab-sided MR bows using almost identical timber, they come out around 190#. It's been done before. We know that it's perfectly achievable to shoot bows up to and over 200lb if training and discipline (something no army is alien to) are followed. Here's a photo of Eirik Diserud pulling a 190# - 200# bow. He's already at 24" - many of the MR arrows are 27" or 28" long. Eirik obviously doesn't look like a weightlifter/power lifter any more than Joe does. Technique gets these bows back, not looking like you're made of solid cheese. I have no problem with saying that English warbows could be over 200 lbs. My problem is with the statement that they would have been common. This simply doesn't correspond with the available evidence. The distribution of Mary Rose bows were not all at the upper end of the scale. "Coulda woulda shoulda" does not a scientific argument make. I have studied Strength Training through the National Personal Training Institute. There are some things.... firstly, a Dumbbell Row is a compound exercise, yes, but it still does use only one arm. A Barbell Row, or Bent Over Row, uses both arms. Theoretically, you could Row with both of your arms at once with a dumbbell... but that is just not how it's done. Drawing a Bow is very much simply a Cable Row. In many gyms, there is a cable machine called a matrix which allows you to basically, draw a bow, plus a bunch of other things. Now, this would be half of the bow draw, in reality. So you would not gain the benefit of your other half. Back then, they did not know about strength training, you are correct. But, without knowing it, they did strength training every day. Strength and resistance training is more than lifting weights. It is even more than lifting heavy weights. Training with a sword, shield, armor... and especially training with a bow, would have provided a lot of strength. Mostly power, except in the case of the Bow, I image it is a lot of strength and power. If you look at the way our soldiers train today, you'll notice it relies heavily on endurance. This is because a lot of what they do involves long periods of time walking and standing, also lots of long distance running and short distance running. All with variable amounts of weight. This would easily be true for people back in those days. But the difference lies in the fact that their weapons required a lot of energy to wield, unlike guns. A life of constant training would really bulk and/or lean them up. These people would be getting their strength training out of their every day lives. They would not look like professional strength athletes. This is mostly due to their diet, health, training efficiency, and also the fact that they were not Power lifters. That guy you posted is a power lifter. He looks like he does steroids, I am not saying he does, I have no idea who he is, and I do not want to be slanderous, but I've never seen a man of that stature who was not on steroids. Firing a bow is not Brute Strength. In fact, Strength does not even mean brute strength. There are many subsections of Strength Training. Power Lifting is the strength training term for brute strength. Where you want to live as much as possible, once. I say, Archery is Power and Endurance. I've found a decent definition of Power online. "Power is defined as the amount of work performed per unit of time. Power is an element of skill-related fitness that is needed to excel in athletic performance. Increased strength does not always translate into increased power. For example, a strong upper body lifts a high amount of weight. However a strong upper body does not always have the ability to throw a shot put very far if enough speed cannot be generated." Power is used to swing a baseball bat, sword, or to pull the string of a bow with any sort of haste. Power is a form of Strength. You have a very huge misunderstanding of what "skill" means in terms of Strength. Power Lifters do use leverage, they use leg drive, and they change their posture to make their range of motion smaller. All of this would be considered cheating if you were doing it as training, but, during a competition, it is used to gain an edge. That is simply a result of the practicality of the rules created by the sport. Skill, in terms of Strength, is referring to Neuromuscular communication. You become Stronger when you lift weight, not because you are building muscle, but because you are teaching your muscles how to more efficiently move. You are teaching your body and your mind how to better communicate. You will build muscle as long as you eat enough calories... and this will make your strength increase too, but not nearly as much, and at a slower progression. 200lbs is not a lot of weight. I weigh 130lbs and can lift 200lbs. No, I can't do a 200lbs dumbbell row, lol. But, a 200lb Bow pull is NOTHING near as difficult as a 200lb dumbbell row. Like I said before, a Dumbbell row is a ONE ARMED compound lift. A bow is not a two armed exercise, but it is certainly more than 1 armed. If you draw a bow by moving a single arm, you're not doing it right. Muscle Mass =/= Strength. That is a huge misconception. When referring to different kinds of Strength, you cannot refer to different kinds of competition. That would be like me saying that Football Running is different from Baseball Running... because in baseball you can only run straight. The differences of the types of Strength are not defined by their respective sport. We should not even talk about Body builders, as they don't even have functional competitions. The large portion of their training is based on diet, and a large part of being a body builder is genetics. Volume =/= Definition. Power lifters do not have dense muscles. A lot of them look kind of fat. Body builders have lean, dense muscles. With high definition. They lack raw strength and power, because... well, basically because that's the only way to get to 5% body fat. Power Lifting, specifically, involved Bench Press, Squat, and Deadlift. But, more generally, it refers to lifting the maximum possible in a single rep. If I was an archer, I would train for power and endurance. Specifically pulling motions, for the draw. I appreciate you not being condescending, and neither am I, but I'm sorry... a lot of that sounds backwards. At least, to my understanding. I am an archer and I train on the consistency of my shot. Most, if not all, archers I know do the same. "Most accurate formula for estimating longbow performance?"? Not all archers train for shot consistency and indeed accuracy if their goal is poundage over scoring. I know many archers who train mainly to draw heavier bows, often with an end goal of a certain weight, before worrying about accuracy and consistency. Perhaps some might decide that's the wrong approach, but its far from unusual. It is important, when estimating a formula, to understand the limitations. If a 200lb bow is not as hard as we assume, our estimations may be completely off. Some people say 200 is too high for accurate testing. Being an archer today must be different. I have no real knowledge, but I'm assuming you are not training to fire a bow with another 100 people at a group of people. The most important thing is that they can all fire, reload, and fire again, at the same speed. I'm not exactly sure what you mean by training for consistency.